The drive around Lake Tahoe’s 72 miles of shoreline is known as “The Most Beautiful Drive in America.” While we’re not disputing that claim, there are roads and highways throughout the country that can certainly compete, with routes that showcase extraordinary mountain views, stunning seaside landscapes, colorful foliage and more. Join us for the ride as we explore some of the best routes near RTX destinations. One of the nation’s most famous roads is well worth the hype. For 80 years, these 469 miles spanning the western ends of both Virginia and North Carolina have provided stunning views of some of the world’s oldest mountains. The parkway gives visitors prime access to overlooks, picnic areas, camp grounds and more hiking trails than you can imagine. 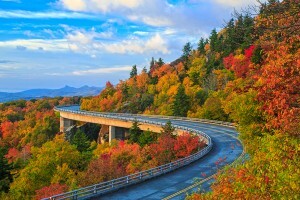 Towns like Banner Elk, North Carolina, are a great home base to enjoy sections of the parkway over a relaxing week, or make an adventure of it and use your RTX membership to book stays at several different destinations along the scenic drive. New Hampshire’s White Mountains are a premiere destination for fall leaf peeping, with arguably some of the most colorful scenes in the country. This stretch of highway commonly known as “The Kanc” covers 34.5 miles of beauty between Conway and Lincoln. Devoid of any development, this road offers breathtaking views from elevations just under 3,000 feet of the White Mountains, the Swift River, Sabbaday Falls, Lower Falls and Rocky Gorge. 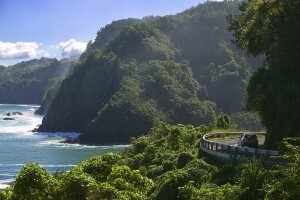 The 64.4 mile stretch along Maui’s northern and eastern coastline is famous for its beauty, as the hairpin curves wind through lush tropical rainforest with panoramic views of the Pacific along the way. Parts of the road are unpaved and require slow speeds, stretching the trip to nearly three hours from one end to the other. Connecting Kahului in the west to just east of Hana, the road includes 59 narrow bridges, many of which date back to 1910. Stops along the route include scenic overlooks, jungle pools, waterfalls and beach access. If you fly into Phoenix and then drive to Sedona for your vacation, you’ll be rewarded with one of the most beautiful commutes imaginable. The fascinating desert landscape changes dramatically on the drive north, as the Saguaro-dotted rocky hills on highway 17 give way to the stunning and vibrant red rock formations on state route 179. From Sedona, head north to Flagstaff through Oak Creek Canyon for even more variations in the landscape, as the stunning views increase with the altitude. This route that covers most of California’s coast is one of the country’s most popular scenic drives. The 550 miles along state route 1 feature stunning seaside views as well as stops at iconic landmarks, picturesque towns, national parks and major cities. The most dramatic scenery can be found in the Central Coast section from Monterey to Santa Barbara. 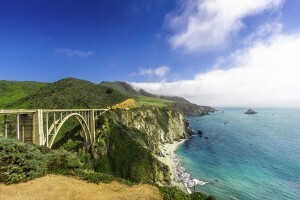 Must-see attractions along this route include Hearst Castle, Big Sur, Carmel-by-the-Sea, Bixby Bridge and Monterey.